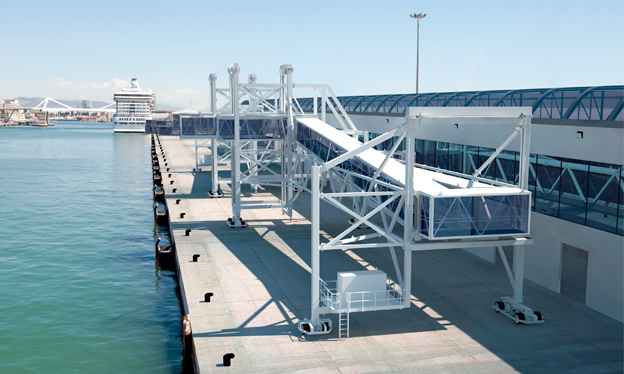 Barcelona, 15th March 2019 – ADELTE, an engineering company based in Barcelona and the world leading specialist in the design and manufacture of Seaport and Airport Passenger Boarding Bridges has been contracted by three cruise ports in the USA to deliver a total of six Seaport Passenger Boarding Bridges (SPBBs) to their cruise terminals. Last month ADELTE was contracted by the Massachusetts Port Authority to deliver in 2020 a SPBB for its Raymond L. Flynn Black Falcon Cruise Terminal. The contract is a result of a competitive tender process in which ADELTE delivered the best solution. The HYDRA-type Seaport Passenger Boarding Bridge (SPBB) will be capable to operate with current and future new generation cruise vessels, including those vessels with overhanging life boats, and the SPBB will replace the current system installed in 2001. The SPBB will be designed and manufactured in Spain and will be transported completely assembled from the port of Barcelona to Boston. Earlier this year ADELTE has also been contracted by Port Miami (Miami Dade County) to deliver two symmetrical SEDNA-type SPBBs for NCL’s new Cruise Terminal B and one SEDNA-type SPBB for Cruise Terminal C. The two SPBBs for Cruise Terminal B will be delivered in time for the inauguration of NCL’s new iconic terminal, which will be known as the “Pearl of Miami”. The SPBB for Cruise Terminal C will be delivered later in 2020. All three SPBBs will be capable to operate with the current and future cruise vessels, including those with overhanging lifeboats, and the design and manufacture will take place in ADELTE’s offices and manufacture facility in Spain. All three SPBBs will be transported completely assembled from the port of Barcelona to the cruise terminals in Miami. When the systems are installed, Port Miami will have a total of eight ADELTE SPBBs in operation at the cruise terminals B, C, D and F.
Last year ADELTE also won a contract with Canaveral Port Authority to deliver in 2019 two symmetrical SPBBs for the new state-of-the-art Cruise Terminal 3. The new terminal, currently in construction, will be the homeport for Carnival Cruise Line’s newest and largest XL-class cruise ship “Mardi Gras” and the HYDRA-type SPBBs will be capable to serve all current and future Carnival cruise vessels at this terminal. The design and manufacture of the SPBBs will take place in Spain and the structures will be transported to Cruise Terminal 3 in Port Canaveral where they will be assembled. When the systems are installed, Port Canaveral will have a total of eight ADELTE SPBBs in operation at the cruise terminals 3, 5, 6 and 10.